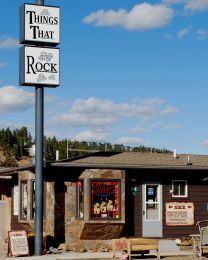 THINGS THAT ROCK is one of the Black Hills best retail shops for a wide selection of local polished rocks and gemstones. Pan for gold or garnets or have your picture taken in a real ore car. Shop a unique line of fossils, minerals, fountains, rock lamps, bookends, candle holders, carvings, wind chimes, sun catchers and rough rock. THINGS THAT ROCK also has gemstone beads, seed beads, beading supplies, leather hip purses, gold pans, rock picks, books and crystals. If you can’t find something in the Classy Casual line of jewelry, we offer custom jewelry design. Stop in for directions to rock hunting and gold panning locations.